PHUKET: The investigation into a Phuket Tourist Officer involved in a gunfight with neighbors that left two men dead and two, including the officer, injured on March 20 (story here) has come to a standstill. 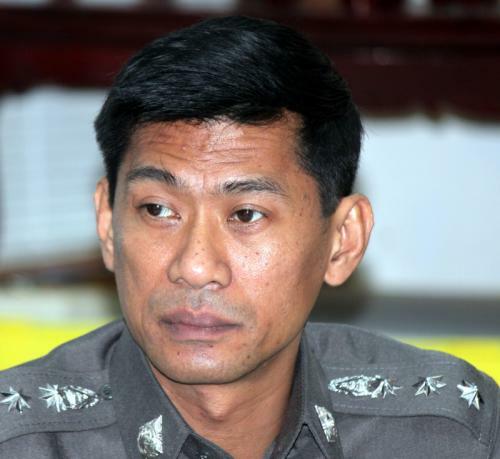 Police are still waiting for results from the Office of Forensic Science Police to determine whether the bullets that killed the two men were fired from Tourist Police Officer Pinchai Piyadilok’s gun, Phuket City Police chief Col Sermphan Sirikong told the Phuket Gazette. “The Office of Forensic Science Police is loaded with cases from across Thailand, so we cannot be certain when the results will come. When they do, we will pass them along to the Public Prosecutor,” said Col Sermphan. “We will consult with the prosecutor’s office to determine which charges to pursue against the suspect,” he added. Sgt Pinchai, whose right leg was amputated in order to save his life (story here) was discharged from the Prince of Songkla University Hospital in Haad Yai in April, he said. “We let him out on bail in order to get him the treatment he needed at the hospital. He is now recovering at his house in Chumphon. “He lost a leg, which makes it almost impossible for him to get around, so we are not worried that he will skip bail,” added Col Sermphan. The other survivor from the gunfight, Natthapong Kaewkuanchum, 25, who was shot three times in the chest, has also been discharged from hospital and is recovering at his house in Nakhon Sri Thammarat. “When the incident happened in March, Mr Natthapong declined to give any statement to investigators. He claimed that he did not remember what happened. We are in the process of contacting him and will try to question him again. “As for Sgt Pinchai, who also has not told us anything about what happened on the day of the incident, we are not in a position to force him to tell us anything. Therefore, we still don’t know what happened in that room,” concluded Col Sermphan.